This unit sits right up front to the ocean, just steps away to wonderful soft sand beach. (2) Phone in kitchen and master bedroom. 2 Phones, 3 Cable TV, 2 DVD's, Gas Grill (BBQ)And flat screen TV in living room!, Unit will sleep 6 people! Excellent location! Peaceful & scenic! Everything was clean & ready when we got in! Communication regarding booking & entry was easy to understand. It was just steps from the condo to the beach with great light. Convenient use of office equipment (not in unit) to print boarding passes or coupons was also helpful. Just across the street from excellent restaurants, massages and shopping! We cooked our own meal on the outdoor barbeque & met the nice neighbors who own there. Very convenient location for sight seeing, too. This was an excellent choice for my immediate family of 5! Well maintained and clean in a quiet building in a beautiful setting! You won't be disappointed if you book this unit! LOCATION, LOCATION, LOCATION--if you want the beach and a wonderful vacation, you MUST stay here!! I rented this condo for my parents, brother and my fiance last week, and this was SO perfect in SO many ways!! Upon our arrival, we met Patty and she was amazing! She gave us really great suggestions on where to eat lunch/dinner and so helpful!! The property manager, Jeff, was also very great (we want his job! LOL)! He cleaned the pool everyday, turned over the chairs and just kept the whole place looking great! One of our favorite activities was to join the owners on the 'green' grass by the water and watch the sunset with our favorite cocktail. At the end of the grass is rocks, and its so awesome because you can see so many TURTLES!! We even bought a snorkel set so we could check them out. There is a VERY SHORT path down to the beach, im talking like 50 feet to put your feet in beautiful sand and crashing waves. My mom and I snorkeled every morning and saw TONS of sea turtles, various fishes and a super mini octopus! AWESOME. We loved the Lanai (patio). I took several naps in the red chair, just listening to the ocean and enjoying the day. Mahalo for being our guest at the Kamaole Nalu! It's wonderful to hear that you enjoyed your time on the island and at this property. We would love to host you again here, and as a return guest with Alii Resorts you are eligible for our 5% Return Guest Discount! Let us know when you are ready to return to paradise!! Aloha and Mahalo for the wonderful review! We are glad to hear that your stay was so well enjoyed. It sounds like you fit right in with the Aloha spirit and made lots of new acquaintances. 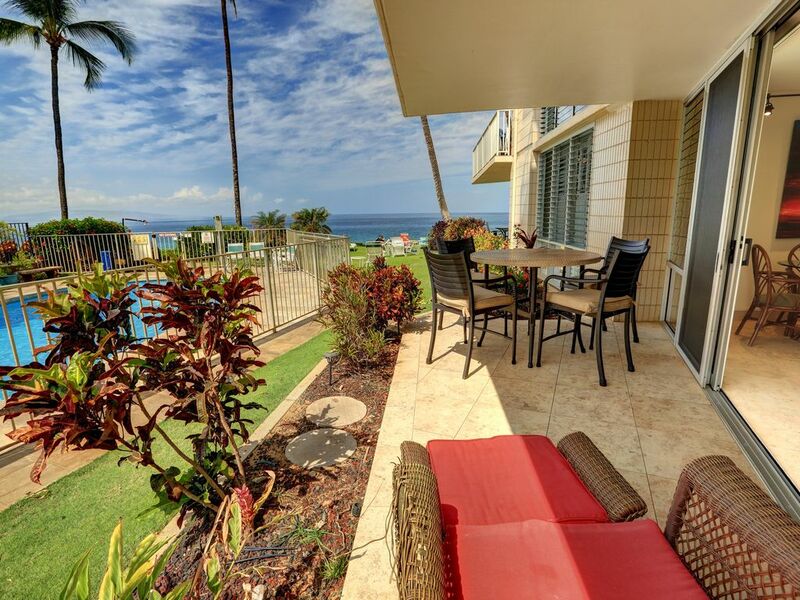 As a return guest with Alii Resorts you will get a discount for the next stay you book with us. Thoroughly enjoyed our stay for a week right by the pool which was ideal with a 6 & 8 year old. 3 gas bbq's close by. This unit is 2nd in from the front so a great view. Listing says sleeps 6 but you must be aware that 4 would be sleeping in the same room, 2 in each double bed. The bathrooms and kitchen have been upgraded, the latter has everything you would need. Starter kits of soaps, detergents. etc. are provided. Linens in good shape with beach towels too. The unit had a very safe feel to it. I did read a review somewhere before we went saying the kitchen sink was filthy and prewarned the resort, only to find it was the same when we got there. I decided that the brown residue was possibly the finish coming off the bronze/coppery sink, and not an indication of the cleanliness of the unit. Sugar ants can be a problem so make sure there are ant traps - the office will provide them. Would rent this unit again. Mahalo for taking the time to share about your stay here at the Kamaole Nalu unit #105. You are correct that the kitchen sink is clean, and any appearance otherwise is due to the unique designer materials used for the hammered finish. We look forward to hosting you again!! Too many other great condo choices...Pick one! Unless you don't mind little peace and quiet this unit is fairly nice. Kids splash and yell in the pool all day, then early and late risers are loud. No air conditioning so you need to keep your windows open...neighbors patio is right outside the master, we had smokers & loud talkers all week long! Says it sleeps 6, don't be fooled by that unless 4 are children & don't mind sharing double beds cramped in a hot back room. Overall dirty, very used furniture, and not well equipped with extras. Remodeled? When? Mahalo for sharing about your stay at the Kamaole Nalu, and we are sorry to hear that your visit was not everything you hoped it to be. This unit underwent a complete renovation in late 2014, and had your concerns been brought to our attention, we would have worked to correct them to the best of our ability. We invite you and your family to give Alii Resorts another chance, and our agents will be happy to help find the best condo to suit your family's needs.